Prerequisites: above average level of fitness, multi-day hiking/trekking experience with 4+ hour days. 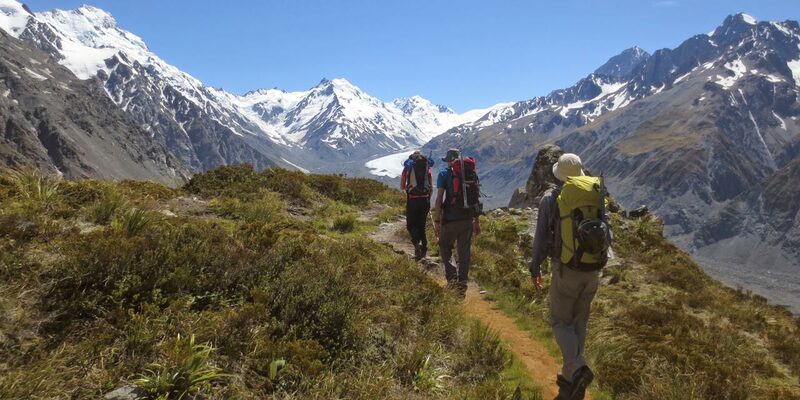 Trek through amazing alpine terrain, surrounded by New Zealand's highest peaks and longest glaciers. 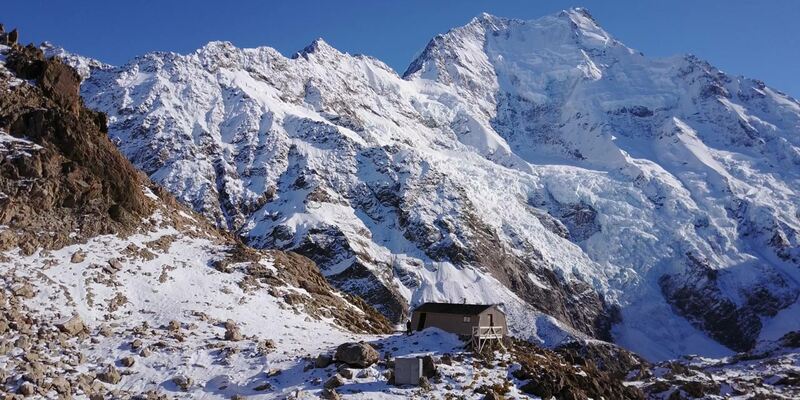 Enjoy a night in the private Caroline Hut, savouring the fabulous views of the 2000m high Caroline Face of Mount Cook, New Zealand's highest ice face. Relax in its wonderful setting on the Ball Ridge, high above the Tasman Glacier, and be awed by the ice avalanches rumbling down Mount Cook. 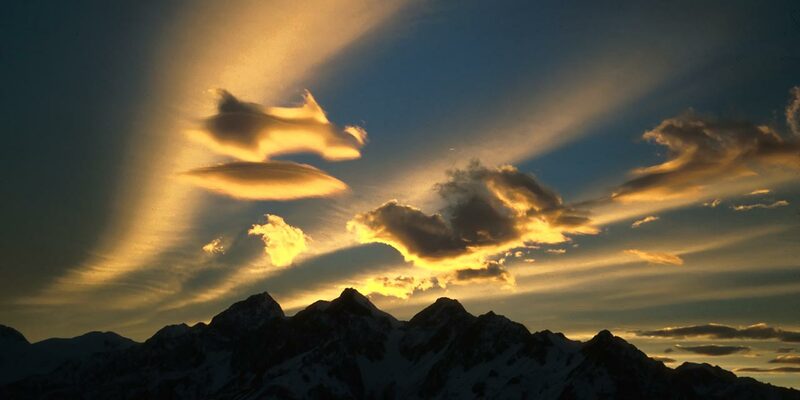 Sunsets in this high alpine environment can be incredible! Climb Fergan's Knob with your guide in the morning for even more stunning views before beginning your descent. Enjoy the unique alpine flora and bird life on your way back down Ball Ridge and out to Mount Cook Village via the Tasman Valley. The views out over the Tasman Glacier are even better in the return direction. The Aoraki Mount Cook Trek is a 2 day alpine adventure in the Mount Cook Range accessed from the Tasman Valley. The Aoraki Mount Cook Trek is a 2 day alpine adventure in the Mount Cook Range accessed from the Tasman Valley. 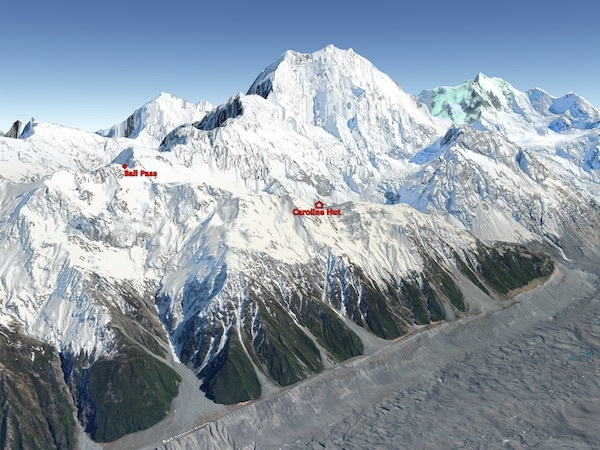 The hiking route on the first day follows the Ball Ridge, high above the Tasman Glacier, and opposite the mighty Caroline Face of Mount Cook, New Zealand's highest ice face. 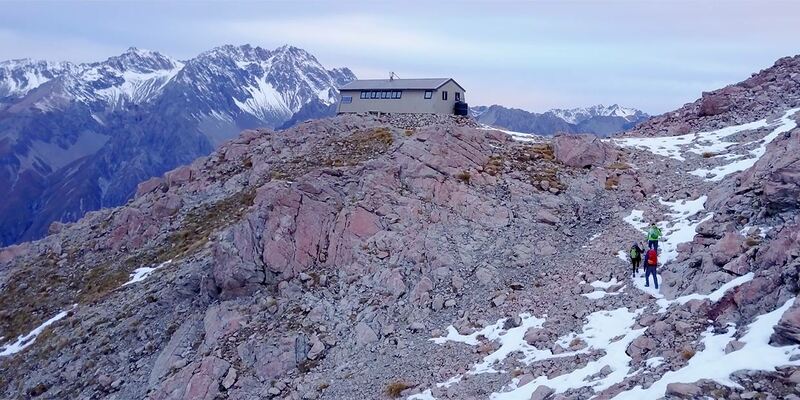 You'll spend a night at the private Caroline Hut (1800m) soaking in its stunning setting on the Ball Ridge with astounding views of the surrounding peaks. On the second day you can climb Fergan's Knob with your guide in the morning (if time and conditions permit). You will have abundant photographic opportunities and time to enjoy the unique alpine flora and bird life on your way back down Ball Ridge and out to Mount Cook Village via the Tasman Valley. The views out over the Tasman Glacier are even better in the return direction. Get close to the mighty Aoraki Mount Cook and enjoy breathtaking views of some of our 3000m peaks. 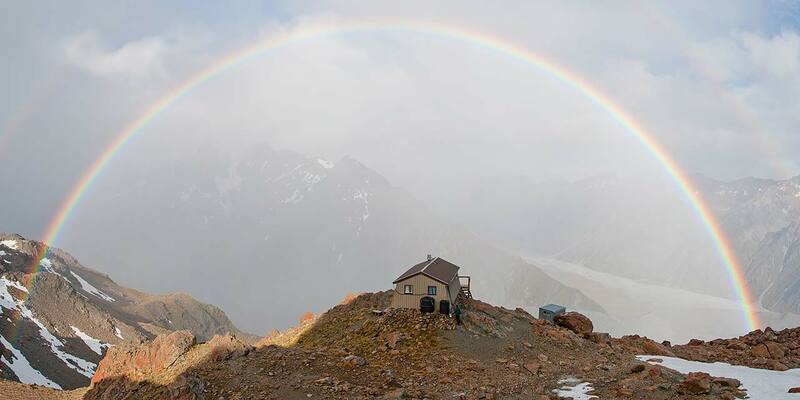 Enjoy the comfort of a night at the private Caroline Hut at 1820m/6000ft, with guaranteed bunk space and a warm meal in a spectacular location. ↑ Aerial photo of the Ball Pass route. Aoraki Mount Cook National Park offers New Zealand's most spectacular alpine scenery. All of New Zealand's 3000m plus peaks, except Mt Aspiring, are contained in this national park and the adjacent Westland National Park. This is New Zealand's climbing mecca. Most peaks are accessible only to experienced mountaineers. 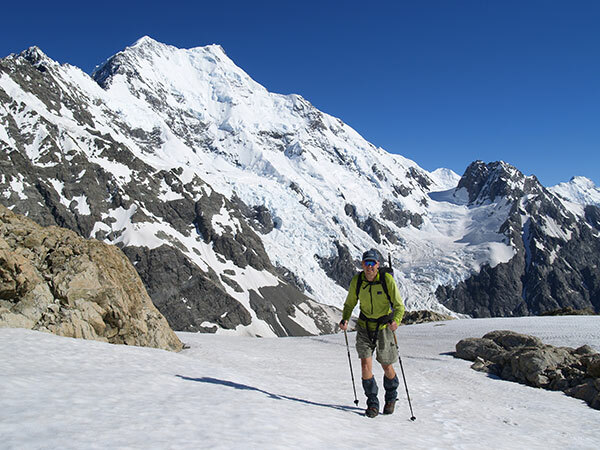 However, alpine hiking or trekking is possible close to Mount Cook on the guided Aoraki Mount Cook Trek, in the company of experienced mountain guides. On the Aoraki Mount Cook Trek you will enter a "topuni" area, a place of great spiritual significance to Ngai Tahu, the Maori tribe who were the first people to occupy most of the South Island. 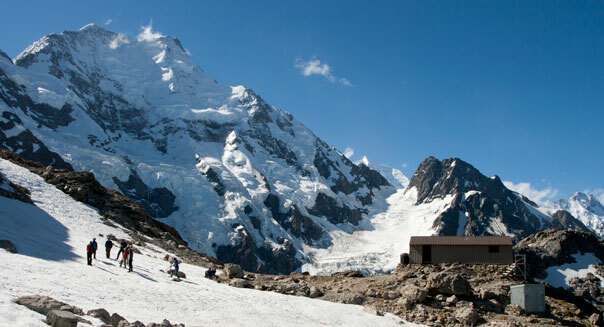 ↑ Caroline Hut is the ideal location for an active mountain holiday. 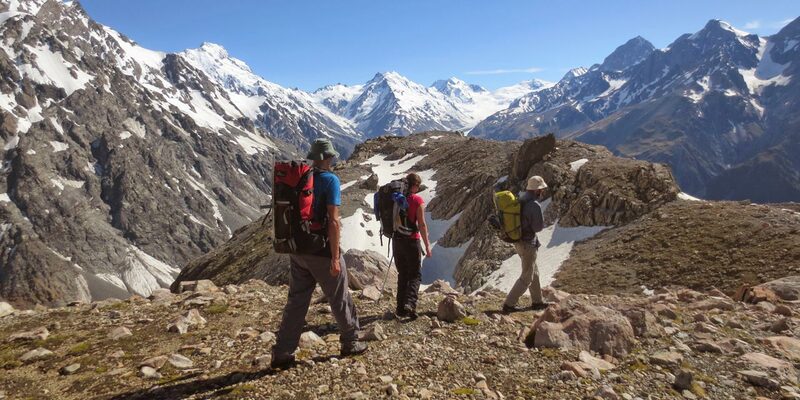 For the Aoraki Mount Cook Trek you need to have previous hiking, backpacking, tramping or bushwalking experience. This trek is beginner mountaineering and is more demanding than many other popular treks. You need to be sure-footed, have good balance and have previous hiking, tramping or bushwalking experience. Crampons and ice-axe may be required early season (November-December), but you are not expected to have previous experience with these. All trips to Caroline Hut require above average fitness to cope with the mountain terrain. Early season (November-December) you are likely to encounter soft snow even below the hut. If you have never walked in deep snow before, then the best way to prepare for this is to walk through sand dunes or somewhere where there is loose sand, where you lose a good percentage of your momentum with each step. Mid to late season (January - April), when the snow has melted back, you will encounter loose scree (rock) slopes in places. The best training for this is to hike along stony riverbeds or beaches where there is an uneven surface, where you have to watch your foot placement. For a less strenuous option, we recommend the Tekapo Trek. Early season (November - December) there can be deep snow to contend with. If necessary we will outfit you with snowshoes. Late in the season (mid February - April) snow has often completely disappeared. However, even in the middle of the summer there can be new snowfall, into autumn (March - April) the chances of this increase. Aoraki Mount Cook Trek is a 2 day trip, taking you up to Caroline Hut on Day 1, possibly ascending Fergan's Knob before returning on Day 2. 8am gear check at Alpine Recreation's Edelweiss Lodge, 8 Erebus Place, Lake Tekapo. As the hut is fully stocked we only need to carry some fresh items of food (e.g. bread, fruit, vegetables, meat) and our personal clothing and equipment. Drive to Mount Cook (about 1 hour), transfer to 4WD vehicle and drive as far as possible up the old Ball Hut Road, parallel to the Tasman Glacier. The effects of glacial recession are very evident as we hike beside the lateral moraine. From Ball Shelter, climb 850m up the Ball Ridge to Caroline Hut at 1800m/6000ft, perched right opposite the awe-inspiring Caroline Face of Mount Cook. The panorama includes Aoraki Mount Cook and Mount Tasman, all the mountains adjoining the Tasman Glacier, and Lake Pukaki (4-6 hours trekking). Option to climb Fergun's Knob on the ridge above Caroline Hut before returning via the Ball Ridge and Tasman Valley. This time we have the 29km long Tasman Glacier stretching out in front of us to the north. Our descent route allows good views out over the ever-expanding terminal lake of the Tasman Glacier. During hot weather a refreshing swim in Blue Lake at the end of the hike is a great way to finish (4-5 hours hiking). We finish back in lake Tekapo at about 5pm. 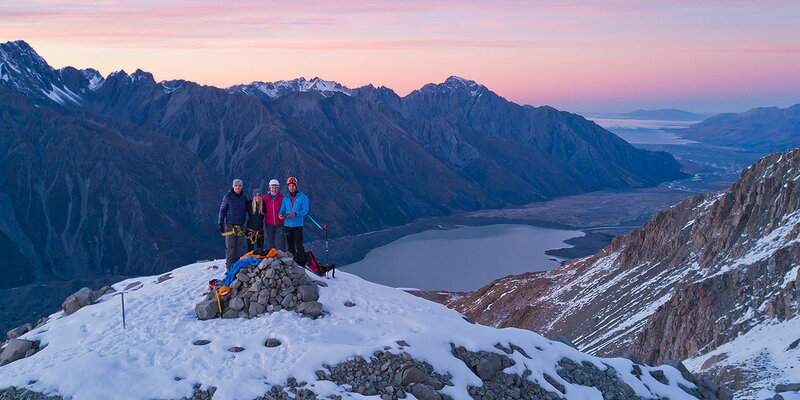 → Aoraki Mount Cook Trek Clothing & Equipment list. 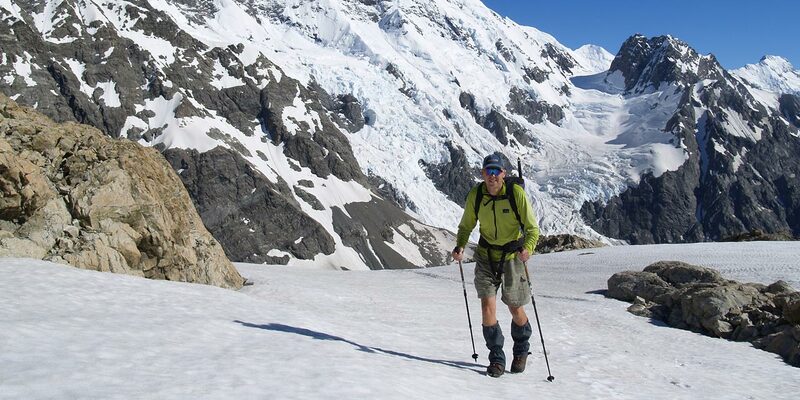 Answers to common questions about the Aoraki Mount Cook Trek are listed here. Please see our Trekking FAQ's page for anything not specifically related to this trek.